59 percent say they have no money left after paying for bills. 56 percent are paying for their children’s education. 44 percent have lost a job or taken a pay cut. 44 percent have too much debt to pay off. 37 percent are caring for an elderly parent or relative. 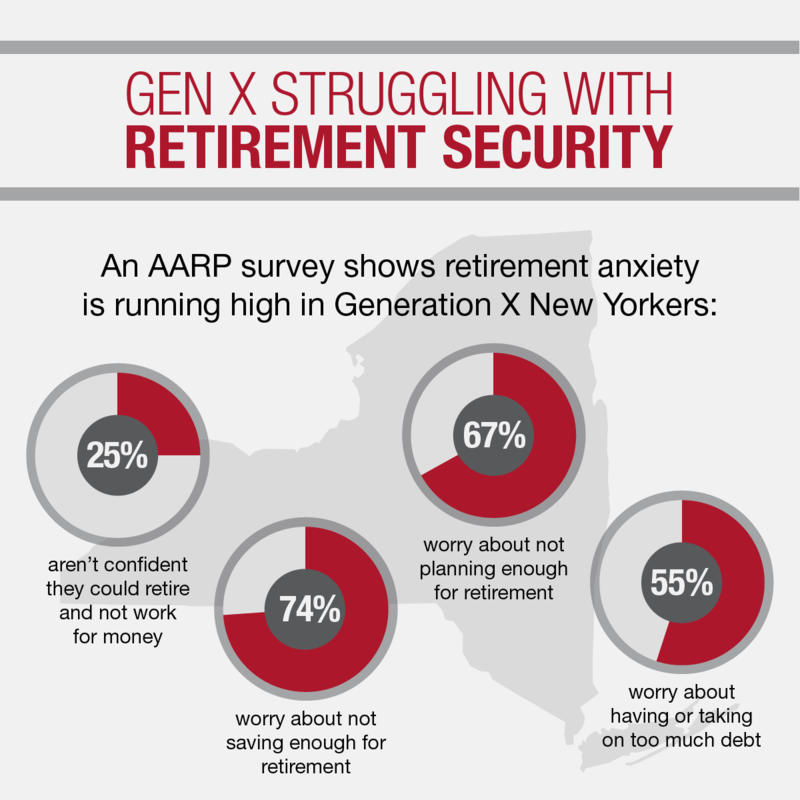 In May, AARP reported on the findings of this survey at a retirement readiness event in Albany. “We know Boomers are worried, but the fact that Generation Xers are even more worried is cause for alarm and reflection,” said Beth Finkel, the state director of AARP in New York. “Since an uncertain financial future for New Yorkers is an uncertain financial future for the state, it is vital that these worries be addressed.” Americans are 15 times less likely to open a retirement savings plan on their own compared to if their employer offered one. To help address this and other concerns, AARP is calling for a state-sponsored retirement savings program. Deputy Comptroller Thomas Nitido represented NYSLRS at the event. He agreed that such an system could be useful, but workers would still face the challenge of finding extra money to put aside after paying bills. He also said that New York State Comptroller Thomas P. DiNapoli would prefer to see a federal solution to the retirement issue. However, that was “unlikely” given the political mood of the U.S. Congress. Content last revised July 29, 2015. This entry was posted in Members and tagged AARP, AARP-NY, Baby Boomers, Boomers, Comptroller Thomas P. DiNapoli, ERS, Gen X, Gen Xers, Generation X, members, New York State & Local Retirement System, NYSLRS, personal savings, Personal Savings Plan, PFRS, retirement planning, retirement security, savings program, state-sponsored retirement savings program on July 29, 2015 by NYSLRS.